Family Adventures in the Canadian Rockies: All Aboard for Winter Adventure - Are you Ready? Let's start with a winter-themed pop quiz! Ready? 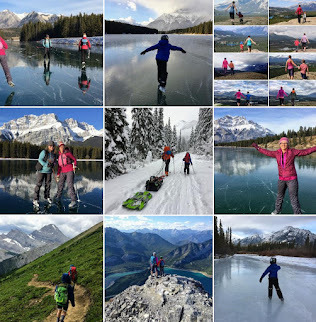 Where is the best place to go snowshoeing with kids near Calgary? How about near Edmonton for you folks up north? How does one go about choosing a good safe trail for the family that doesn't enter avalanche terrain? 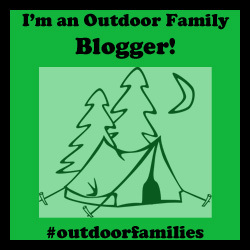 What kind of snowshoes are the best for those wanting to get into this sport as a family? 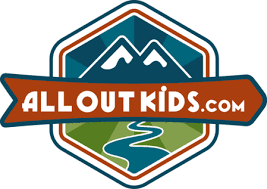 At what age can you introduce snowshoeing to children? And how do you find snowshoes for tiny feet? This fall, Campers Village in both Calgary and Edmonton wants to make sure you have all the knowledge required to safely get your family out snowshoeing this winter. We've had our son on snowshoes since the age of 3 and it's been a great way to spend quality outdoor time together as a family. You can't tell me this doesn't look fun! Campers Village will be holding information sessions on Snowshoe Expeditions in both Edmonton and Calgary this October. For information on the Calgary session and to register, click on the Calgary link. For information on the Edmonton session and to register, click on the Edmonton Link. In the sessions, you will get tips for the right gear to get started, get suggestions for destinations near your city, and get valuable information on what you'll need for your next snowshoe trip. Snowshoeing is a LOT of fun! Seriously! And bonus - the snowshoe classes are FREE! You can even bring the kids with you! How can you convince reluctant children to actually fall "in love" with snow and cold weather? Is it even possible??? 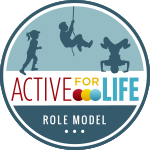 What are the best ways to stay warm outside, avoid hypothermia, and stay safe when playing outdoors in freezing temps? Do you know how to tell when you are in avalanche terrain? And do you know how to stay safe when you are?? My child used to hate winter with a capital H. He has grown to love it. For real! Again, Campers Village wants to help you and your family get prepared for the upcoming winter season. 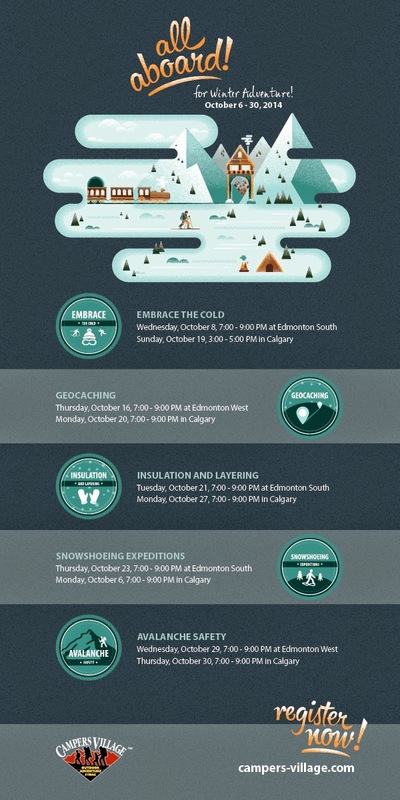 They will be hosting information sessions on embracing the cold, geocaching, insulation and layering, and avalanche safety this October in their Calgary and Edmonton stores. Kids can learn to love snow. Really! For me as a parent, raising a child who would love winter and embrace the season didn't come easily. However, with a bit of perseverance and help from other outdoor families we have succeeded in creating at least a fond appreciation for snow and the fun activities that you can do in snow. In fact, off the top of my head, I can think of 10 fun things to do in the snow with kids. Can you? If not, you definitely need to check out the "embracing the cold" sessions at the Calgary and Edmonton Campers Village stores. And, for those in the Calgary area, if you come to the Embracing the cold session, you just might get to meet little ol' me - cause, guess who's teaching?!! Biking is on our list of top ten fun things to do in the snow. Is it on yours? For a complete list of all the info. sessions that Campers Village is offering this winter with dates and times, check out the poster below and visit the Campers Village website to register. As mentioned earlier, all sessions are completely FREE, including the Avalanche safety session where you'll hear from experts who have seen and experienced avalanches in action, and can tell you some amazing stories! Get Prepared, Get Educated, Get Out There, And have FUN this Winter! This story was sponsored by Campers Village but all photos are my own and clearly show that we love winter! I hope you'll join us on the trails and in the snow banks this winter.